Anna & Andy — The Windflower Design Co.
Anna and Andy got married on her families property in July in Kalamazoo, Michigan. Her parents, brothers, sister-in-law and neighbors planted the winding flower path in the field where they exchanged vows and celebrated in the evening. 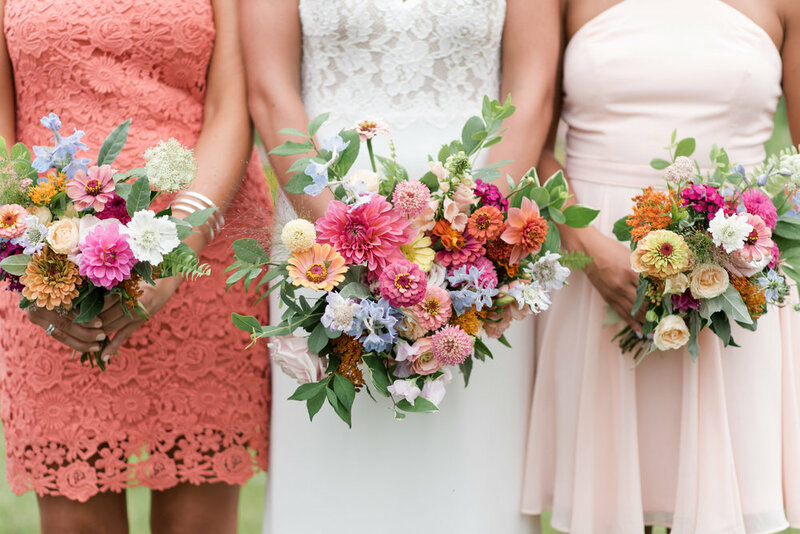 The couple requested bright fun flowers and wanted the zinnias from the community garden on site to be used. We took inspiration for the blooming field, the garden and the bright, joy filled personalities of both Anna and Andy. Their friends and family were so great to be around and it was a team effort to make the day happen. 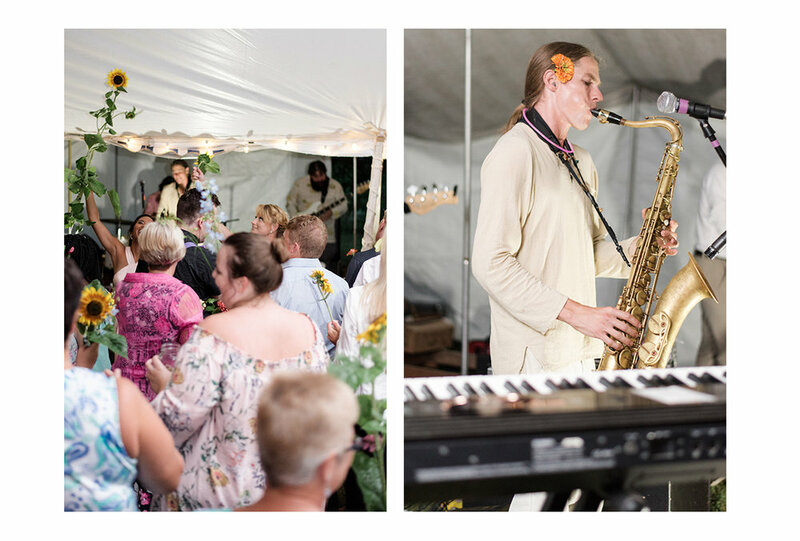 Her brother's band played at the reception and her sister-in-law did the rental items. We took the lead on the flowers, sourcing from wholesalers and several flower farms in the area. With thirty tables, it was a full fledged party. We couldn't have done it without the help of aunts, friends and cousins who joined our "flower committee" for prep and setup. Andy requested hydrangeas from his grandmother's garden be used in their head table design, which made our hearts melt a bit. So we added a few of grandma's treasures to the design. A couple in front for all to view and a few on the back for the couple to admire. Anna's parents and the members of the community garden really wanted sunflowers from the garden involved so they took center stage on the dance floor. Aaron, Anna's brother, is the lead of the All American Funk Parade and always puts on a wild fun show. Typically they adorn their stage with a few faux blooms, but for this wedding we went for the real thing. We did a six foot floral piece for the front of the band area. It was filled with big sunflowers and colorful zinnias from the community garden along with local foxglove and amaranth. A few roses and big blue delphinium added more color to the mix. Halfway through the dancing the Father of the bride showed up with an armload of sunflowers and started passing them out. It was really a delight to dance along with everyone, flowers waving in the air, smiles all around. There are so many great behind the scenes moments to share but I'll save those for another post. A huge thanks to Anna and Andy and their families for having us be a small part of their celebration. A huge thank you to Photography by Raisa who went above and beyond to capture the day.